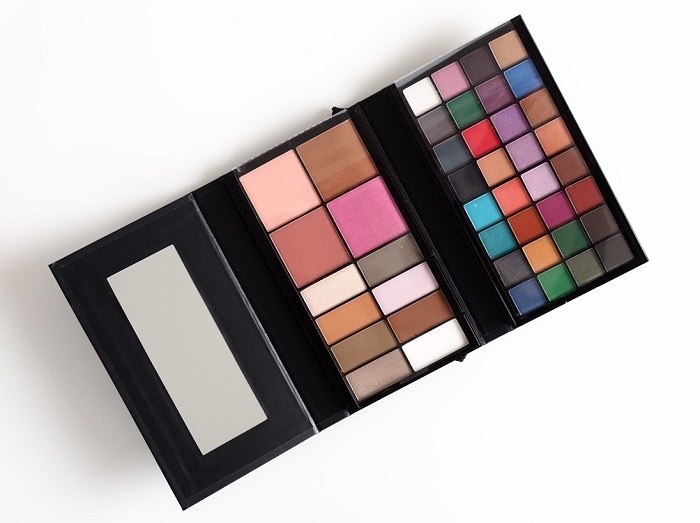 It’s easy to bring some color to your makeup with small adjustments. This time I ditched the classic black liner and replaced it with bright yellow. Apart from the yellow liner this makeup is very classic – a go-to makeup, that I wear all the time. I used products, that I got to choose from eleven*. I’ve been obsessed with the Beauty School Dropout Freshman palette. It’s super versatile! It can be used as a highlighter, contour, bronzer and a blush. And you can do your brows with it! I’ll probably post about it later, because I’ve been super inspired by it and done a lot of crazy looks with it (snap family knows). I’ve also found a new favorite foundation: Milani’s Conceal+Perfect! Now that I’ve used it for a couple of weeks I can say that it’s pretty awesome. I would compare it to Estee Lauder’s Double Wear Makeup (that I just posted here). It’s full-coverage with a matte finish and it’s very long lasting. The price is obviously cheaper, so it’s a great dupe for Double Wear. Let’s get to the tutorial! For my Finnish readers: You can find a discount code to eleven.fi at the end of this post. Before and after Milani’s Conceal+Perfect Foundation. I love it! I recommend using a damp beauty blender for application. The foundation has a concealer in it too, so it’s a bit thick. Apply a thin layer all over your face (including your dark under eye circles!) and blend the edges well. Apply a second layer of the foundation for the areas that need more coverage, such as pimples. Here is the finished makeup base. 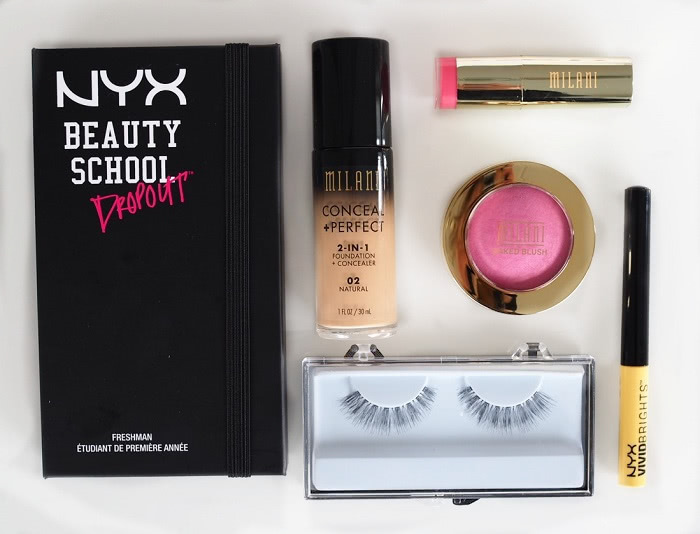 Contour, highlight and bronzer are all done with the NYX Professional Makeup Beauty School palette. Blush is Milani’s Pink Delizioso. Apply a primer and set the primer. I used a matte white and a light pink eye shadow to get a light and an even base. 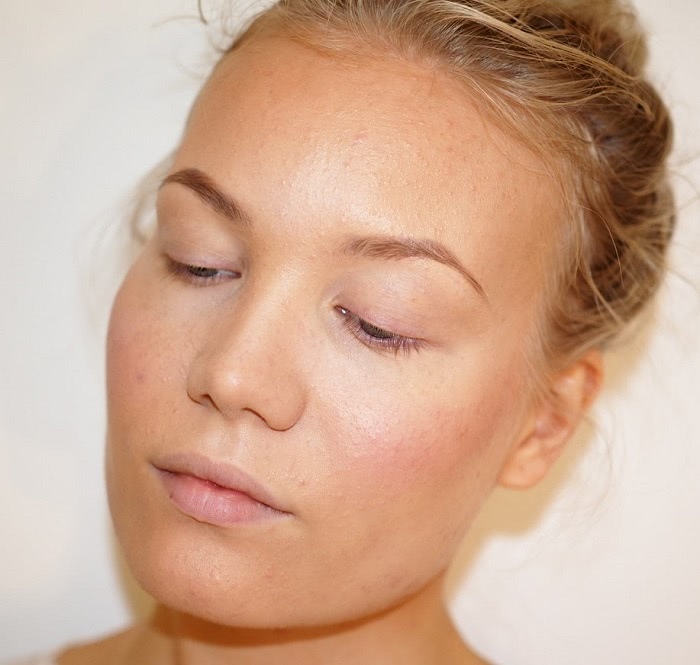 Start to contour your crease with a light brown shade. The placement depends on your eye shape. This is the lightest shade of the contour, so you can blend it to a larger area. Deepen the crease with a darker brown. Apply the lid colour. I used a shimmery warm brown, but added some light shimmer color on top of that to make it more glowing. I also applied some shimmer to my inner corners. Deepen the crease a bit more. Now that you have a lid color it’s easier to blend and see what you’re doing. I used a very dark brown at first and then a touch of black. Use a small brush for this. Line your eyes lightly with a black eye shadow. Apply those crease colors for your lower lash line as well. Create a winged liner of your choosing. Apply a coat of mascara and some lashes. All done! Line your lips with a transparent lip liner. If you want the lipstick to last super long, apply the liner all over your lips. 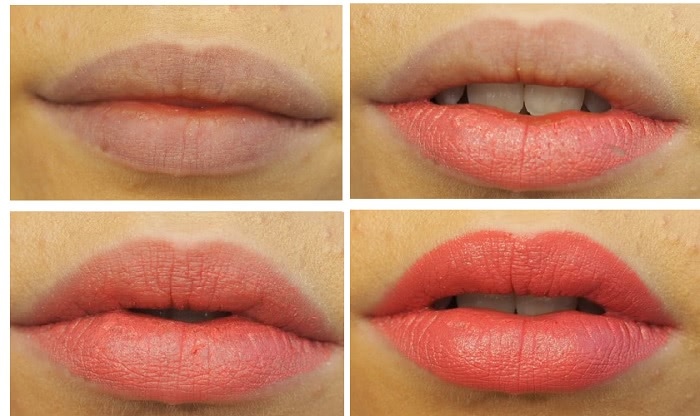 Add lipstick to your bottom lip. Press your lips together to spread the color. Apply a nice layer of the lipstick all over your lips. Now that the lips already have some color, it’s easier to see the lines and apply the lipstick smoothly. What did you think of the makeup? Buy Milani products from beautybay.com. EVE11 code gives you -11% discount of all the normal prices. It can’t be combined with other discounts. Valid till 20.5.17. I love yellow anything on eyes! Such a great idea to go for yello Liner! The look really suits you! 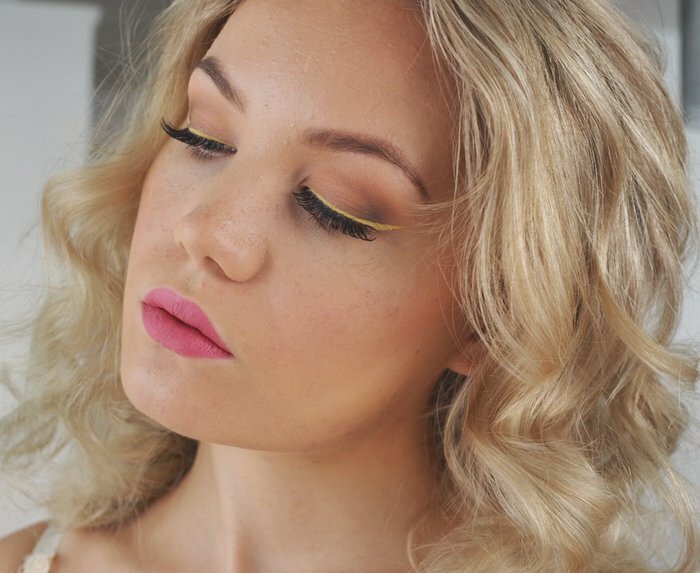 Love this look – the yellow looks awesome with your hair! I love the look of this bold liner, it really makes your eyes pop! I must be braver with colour. I’ve been on the fence of whether or not I should try Milani Conceal + Perfect. It’s on the higher end of drugstore foundations and it seems very full coverage but it seems like it works well for you! How long does the coverage last? True. I still recommend it though. The coverage and the makeup lasts very well – the only thing with my oily skin is that maybe after 5 hours I’m more glowy than I’d like. 🙂 But I just use powder papers to get the shine away and my makeup still looks amazing. Tosi hieno meikki! Miksi muuten huulet rajataan värittömällä rajauskynällä, mikä idea sellaisessa on? En ole aiemmin kuullutkaan. Kiva, jos ehdit valottaa asiaa vähän! Hyvää tätä vuotta! Kiitos <3 Idea siis käyttää väritöntä rajauskynää on lähinnä siinä, että väritön rajauskynä sopii minkä sävyisen huulipunan kanssa tahansa 😀 Oon ehkä siis laiskuuttani tottunut käyttämään sitä - ei oo tarvinnu hankkia montaa eri väristä kynää 😀 Ja rajaushan on siis ihan suositeltu siksi, ettei huulipuna karkaa pieniin juonteisiin ja pysyy oikeasti huulilla. Rajaus (värillinen) helpottaa kans hahmottamaan sitä aluetta, mille huulipuna levitetään. Hyvää vuotta 2018 sinnekkin!